The original SplinterBike returned safely from the V&A after being on display as one of many diverse exhibits in the Power of Making show. It was truly wonderful to have been part of this event and an honour to be included at such a prestigious public venue. You can read more here or see the blog post here. Then we had all the excitement of the SplinterBike documentary première produced and directed by Tim Mills - TopBox Media. It was a full house inside Screen 2 at Cinema City Norwich. There were even a few latecomers standing at the back, determined to catch a glimpse. Recently Tim has made the documentary available on-line so you can watch the whole thing via the internet. Smashing! So far It's been broadcast in several countries and will be available in 2013 onboard Fly Emirates In-Flight Entertainment, so book early to avoid disappointment... or just watch it right here, right now! TopBox Media followed our story and have released the results for your delectation. Follow the project and its comical eleven month journey to fruition, condensed into 51 action packed and often hilarious minutes! Next, a local company here in Norfolk offered to CNC cut all the components for the "improved" SplinterBike CAD designs that I had been busy drawing up. Quantum Industries Norwich were totally accommodating and very generous with their support and time to develop these new ideas. The end result was a champagne and strawberry launch event to reveal SplinterBikeQuantum - a fully working prototype to test the changes from the original design. 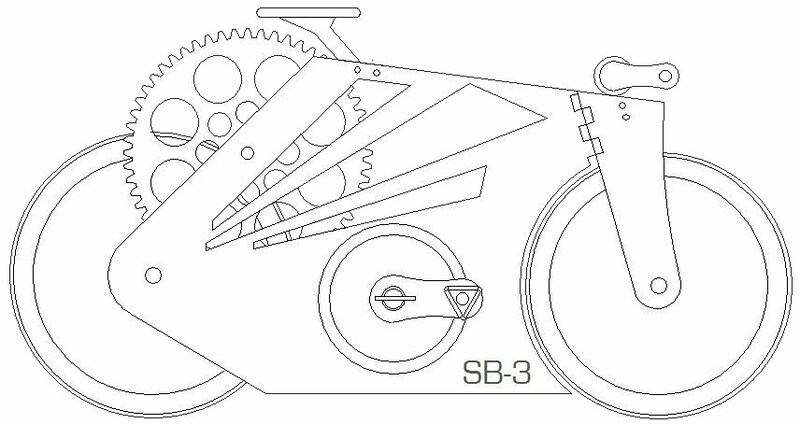 Our aim now is to develop this new format to create SplinterBikeThree that my No.1 SplinterBike pilot James Tully will mount in an attempt to set the Hour Record for 100% wooden bicycles... Stay tuned! 2013: Lots of thrills and inevitable spills heading our way this coming this year! Not only will you be able to witness James and his indestructible underpants suffer at least one attempt at riding SplinterBikeThree for an hour, but also... designs are being layed down for a brand new wooden framed bicycle which is scheduled to be launched in restricted numbers from April 2013. The new SplinterBikeHʌɪbrɪd comprises a wooden frame and wheels like you've never seen before, along with quality non wooden components. Follow me on Twitter for regular sneak previews and developments. All the best for 2013! Michael Thompson.